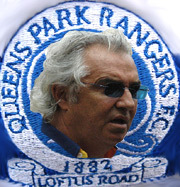 It’s been rumor up until now, but it seems that Renault team boss Flavio Briatore has bought the English Football (Soccer) club Queen Park Rangers. The English newspaper The Sun has quoted Queens Park Rangers Chairman Gianni Paladini confirming that the sale should be completed early next week. “It’s a dream come true for QPR fans and saves this club from liquidation,” Paladini said. “Mr Briatore wants to do for QPR what Mohamed Fayed has for Fulham and turn us into a Premier League club. This could be the escape route that Briatore has been looking for. It has been no secret for some time that he will be exiting Formula One in the near future, and this could be his after Formula One project, taking a struggling Football team and restoring it to it’s former glory. Previous: Alex Shnaider – Repo Man ?